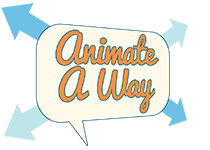 Animate A Way stop-motion workshops and camps for all ages from grade school to adults are held sporadically throughout the year. Happy New Year! Big Things at Animate A Way! There has been so much going on and so much good news at Animate A Way, that we have barely had the time to share it! Most importantly, we are proud to announce that we are now an officially recognized 501c3 organization. After much deliberation, we have made this big leap. With it, we vow that our funding will come from donors and grants and that we will continue to serve our vital mission in the community of San Diego of raising awareness. If you would like to become a regular donor to our cause, please contact us. We owe a huge thank you to Lee Ann Kim and the Pacific Arts movement, for being our sponsor and role model for the past two years as we grew and discerned the best path forward. We are very happy to announce that we have a new board president in Norma Roth (pictured above on the left with Executive Director Steven Topham and Development Director Karla Duarte). She has been an active philanthropist and businesswoman in the San Diego community for over a decade. She is a Rotarian and consummate leader, all while being a mother too! We are excited to find out how she and the rest of the board will help lead Animate A Way and the communities of San Diego forward. Classes at Montgomery Middle School have been going really well. The students have created a great script and began production on the set the week before heading off for Winter vacation. The open community program at Bayside is a blast with many regular attenders. We are back from the holiday break and meeting on Thursdays at 3:30 pm. Lately, the students have been making short films every singly week, and you can see lots of them on our Facebook page, so be sure and follow us! The screening of Coraline at the Bayside Community Center was a lot of fun, with the hugely imaginative film being projected on our new large projection screen. The next screening is February 20 at 6:30 pm, so put it on your calendar now and we will see you then for a great evening.